What is the Difference Between Pressure Cooker and Pressure Canner?Everyone knows what a pressure cooker is, but they are not so familiar with pressure canners. Is there a Difference between Pressure Cooker and Pressure Canner? Well, the solution is that they are the same point since they make use of pressure cooking as their cooking technique. Everyone knows what a pressure cooker is, but they are not so familiar with pressure canners. So what exactly is the difference between a pressure canner and a pressure cooker? Read on, and you will find out. To be simple, we will not get into a lengthy discussion on physics to describe exactly how a pressure cooker works. A pressure cooker is a cooking appliance that is designed to speed up your cooking times faster much more than traditional cooking procedures. A pressure cooker does this by cooking at a much high temperature. It boils water or broth but instead of releasing the steam. It uses traps to stuck the steam inside it. Due to inhibit the steam, it forces the temperature inside the pot to increase, and as a result, the food inside the pressure cooker cooks faster at the higher temperature. Many of the people enjoy canning fruits and vegetables. The problem is while using a water bath method of canning the temperature of the cooking never gets above 212 degrees Fahrenheit. The problem occurs because it takes a much higher temperature to kill a common food born bacteria called Clostridium botulinum (It causes the illness botulism). That is where a pressure canner plays its role. It reaches temperatures over 240 degrees Fahrenheit which is high enough to kill these bacteria. So food safety is one of the main reasons people choose pressure canning over other canning processes. Pressure canners are only meant to be used to cook non-acidic fruits and vegetables. You also cannot make pickles with pressure canners because the vinegar used in that process is highly acidic too. You easily and safely can steam fruits and vegetables in a pressure canner. The pressure canner considers the health matters. The appearance of both the pressure cooker and canner are quite same. There are a lot of difference between the designs for each in the market. Sometimes pressure cookers are designed small as a saucepan. On the other hand, pressure canners have more standard looks. They are often referred to as pressure cookers on steroids. Both the appliance use the same method of cooking (pressure cooking) but they are not same, and also you can’t cook the same sorts of food. Pressure cooker locks the air and steam inside which create pressure to cook food faster. There are a variety of things to cook with a pressure cooker, and you can cook them with ease and also in short time. Pressure canners also use pressure cooking. The best use of a pressure canner is to cook vegetables and fruits items. The fruits and vegetables are kept in a pot or jar while cooking. However, both of this maintain the safety matters at the time of their cooking process. Let’s learn a little more about the pressure cooker and pressure canner, and the way they work. 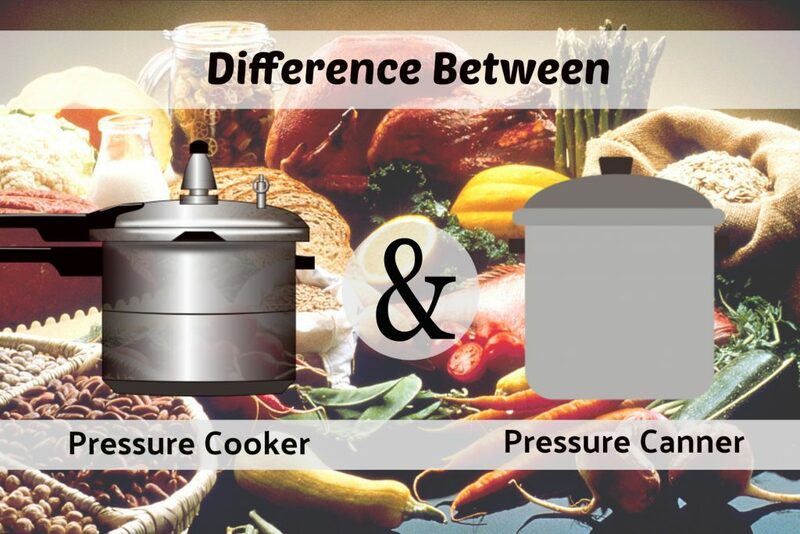 A pressure canner is larger in size compared to a pressure cooker. Canners usually have an ability of 10 Quarts as well as even more, because they need to be large sufficient to accommodate a particular number of jars under. So, you can use a bigger pressure cooker for canning too. On the various other hands, pressure canners could be utilized for tension food preparation, despite the fact that because of their economy size and also weight they are not very functional to deal with for day-to-day cooking. Stoves are usually constructed from stainless steel, aluminum or combinations of both products (aluminum is in the core of a stainless-steel “sandwich”). Stainless-steel is not an excellent thermal conductor, so aluminum (or perhaps copper) is contributed to compensate it. The majority of pressure canners are all aluminum. Pressure stoves often have a working tension of 15 psi (this is the level). Pressure canning requires the use of different functioning pressures. Getting a canner with three various pressure setups is optimal. Stoves often have closing rings constructed from rubber or silicone (gaskets) for the purpose of creating an airtight environment inside the stove as well as preventing the air and also vapor from escaping. There are stress canners (like the All American canner) that have special metal-to-metal securing systems. Having a canner without a gasket can be somewhat useful because there is no should wash it each time you utilize the canner or to purchase a brand-new one every once in a while. Pressure cookers and pressure canners have excellent uses and will remain accessible for a long time. Both of these traditional kitchen apparatus make excellent additions to anyone’s list of useful kitchen products they own.If you intend to buy a pressure cooker or pressure canner, there are plenty of information available about them online. You think Which one will be the best pressure cooking gadget for me? There are many useful pressure canner reviews and pressure cooker reviews online to help you do this.